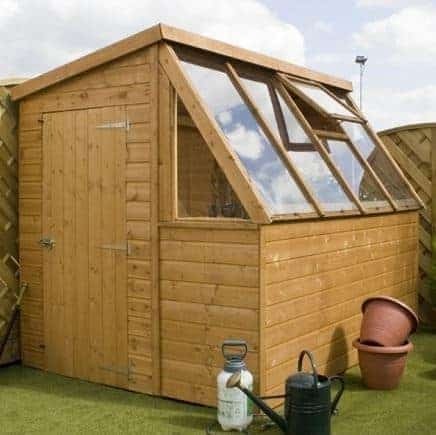 The 8’ x 6’ Premier Groundsman Potting Shed is a fantastic combination shed; a cross between a greenhouse and a traditional wooden garden shed. This superb garden building will serve as a dedicated space for all of your gardening projects. You might also like to see the top 20 potting sheds currently on sale in the UK by visiting the WhatShed potting sheds awards league table. This Premier Groundsman Potting Shed is a great choice for anyone that wants a storage unit and a growing area, but is limited by the amount of space available. 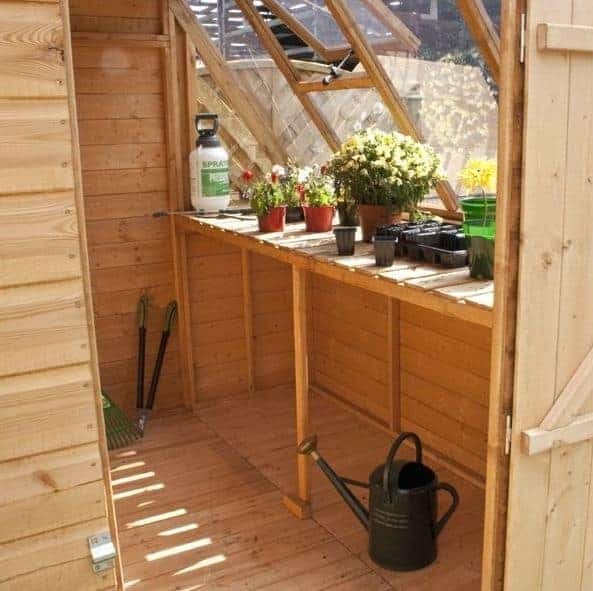 With slanted, styrene-glazed windows that make up a considerable area of one of the shed’s sides, making it perfect for potted plants and vegetables, with a convenient shelving unit ideally placed to make the most of the sun exposure. With ample storage space, including a large area that is situated below the shelving unit, there is plenty of room for garden tools and equipment, as well as any growing products for the potting area. The main structure is made for tongue and groove cladding, with a pent roof – all of which helps to keep the shed dry and at minimal risk of rain damage. One of the windows can also been opened to provide ventilation, if needed. The interior contents will be protected from the elements, as well as damp, rot and mould, all year round. Purchasing a potting shed for your gardening activities is an exciting time. 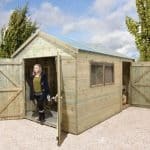 Finding the right shed for your needs is important, as you will no doubt spend many hours in this building enjoying and undertaking a range of gardening projects all year round. In this section we have a look at the different features the Groundsman shed has to offer and show the different ways it can be used to become the ultimate gardener’s paradise. Exterior: The potting shed is a unique design and take on the traditional garden shed or greenhouse. The contemporary style combined with the traditional timber cladding means that this particular model would look at home in a range of gardens. The shed exterior also features a practical pent style roof and feature windows. Interior: The interior of the shed is light and airy, with the large windows giving the illusion of even more space than there really is. A high shelf is built in for all of your plants, whilst underneath and towards the other side of the shed there is plenty of floor space for equipment to be stored. Additional shelving could be added to enable you to organise your accessories and equipment further, as well as keeping the space neat and organised. Windows & Doors: One of the potting shed’s main features is the long windows on one side of the shed, meaning that one side is fully glazed on the top half. This lets an incredible amount of sun and light into the shed interior, providing the optimum growing environment for your gardening projects. 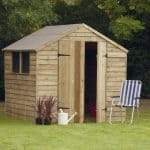 The shed has a single door, which is more than adequate for accessing plants and smaller gardening equipment and accessories that may be stored inside. Security: The shed door comes complete with a strong latch to keep the door shut, keeping the shed dry and secure. If you wish to add a security fixture to the door, this is possible with the addition of a simple fitting. A security fixture may be purchase independently at a modest price. 8’ x 6’ Premier Groundsman Potting Shed: How easy to build? 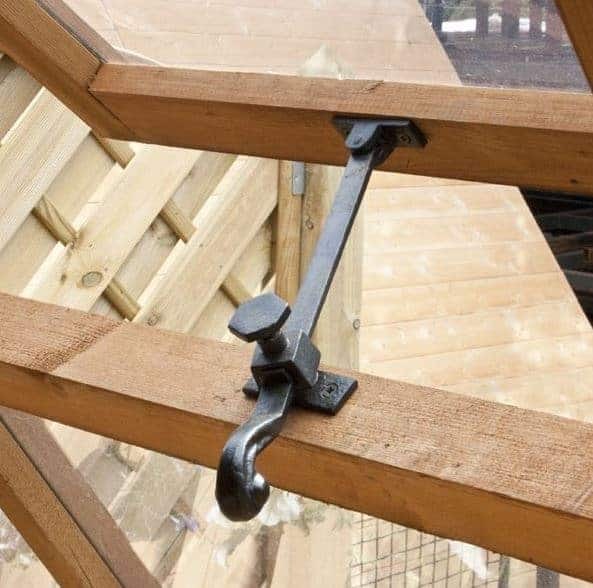 Building the potting shed is made as straight-forward as possible thanks to the comprehensive instructions with easy-to-follow diagrams to keep you on the right track. 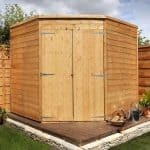 Although the shed has a few more features, both internally and within the structure of the building, all are fully explained and assembly could be undertaken even by those with limited DIY experience. The shed will arrive in flat-packed form and the package with include all of the timber panels, glazing, fixtures and fittings required for assembly. We recommend that two people assemble the shed together, for safety reasons and efficiency. Please note that a professional home installation service is available at an additional cost for those that may be interested. 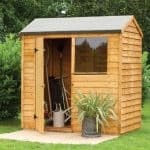 8’ x 6’ Premier Groundsman Potting Shed: What is the overall quality like? This Groundsman shed is a uniquely designed shed with features aplenty for the avid gardener. Constructed from Baltic sourced pine, a timber that is denser and heavier than domestic timber, in 14mm tongue and groove cladding, means that the shed is both sturdy and durable. 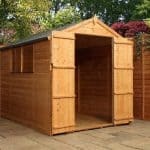 This wooden shed carries a 10-year anti-rot guarantee from the manufacturer, provided it is well-maintained throughout its lifetime and receives a timber preservative treatment both on assembly and annually thereafter. The roof is also cladded and is pent-style to ensure that water damage is prevented by allowing water to run down the sloping roof and stop it collecting at any point. The windows use 2.5mm styrene glazing to provide a spectacular feature window. Sheds like this one should be placed on a flat, level base to provide the building with a sturdy foundation. If you do not have such a base available, a choice of bases are available to purchase as optional extras during the purchase process. 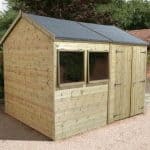 With the 8’ x 6’ Premier Groundsman Potting Shed you really do get the best of both worlds; a good sized storage shed combined with a bright area for all your latest gardening projects. Your plants, flowers and vegetables will flourish and grow under the large greenhouse-style windows. At this great price you can store and organise all of your accessories and equipment, whilst keeping your garden tidy and clutter free.